Our Prince Kuhio #211 is a large 1 bedroom condo with unobstructed ocean views through Prince Kuhio Park located on the sunny south shore of Poipu Beach. The beach is so close you can hear the ocean waves at night while you sleep! 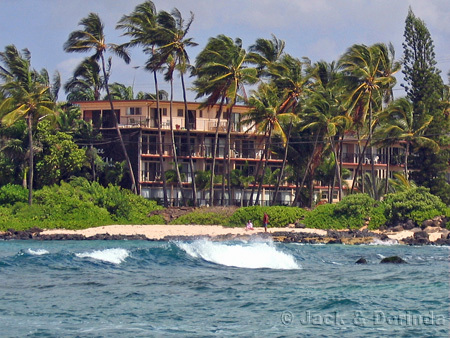 There are two sandy beaches in front of Prince Kuhio Condos. Prince Kuhio Beach has excellent swimming, snorkling, and diving and is famous for the sea turtles you swim with while snorkling. Sometimes you can also see whales breaching and frolicking in the distance. The other, Lawai Beach, is one of Kauai Hawaii's top snorkling beaches but also has 3 prime surf spots: PK's, Centers, and Acid Drop. 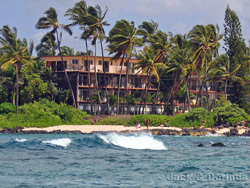 The surfers and body boarders are regulars at this Kauai beach in Poipu. Entertainment is within minutes of our centrally located Prince Kuhio Condos. Two golf courses are less than five minutes away - Kiahuna Country Club, and the championship Poipu Bay Resort Course - site of the PGA Grand Slam of Golf. Location. Prince Kuhio Condos is only a few yards from popular Kauai South Shore beaches with fantastic snorkling and surfing. Also, it is central to many Kauai activities. Great Views. The ocean is only 50 yards away from the bedroom windows and the lanai. The ocean view is unobstructed since there is nothing between you and the ocean but prince kuhio park and a few palm trees. There are also excellent views of mountains and the park from the bedroom. The tropical garden at Prince Kuhio Condos comes right up to our large picture window in the living room and we have a great view of the pool! Bright and Airy. There are Wall-to-wall windows in the bedroom and a large picture window in the living room. This lets the trade winds flow through and the sun shine through! 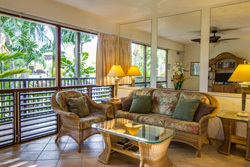 Tropical Living at Prince Kuhio Condos. 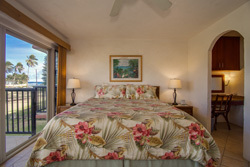 There is a continuous breeze from the trade winds that flow from the bedroom thru the condo and out the living room. Large. Our condo is a very large 1 bedroom and 1 bath compared to other vacation rentals (720 sq ft). Friendly and Cozy Complex. There are only 71 condos at the friendly Prince Kuhio Condos. Swimming pool. 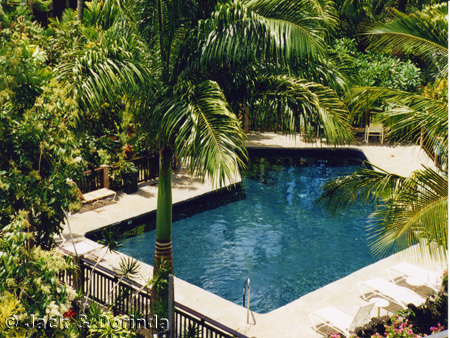 The swimming pool at Prince Kuhio Condos is surrounded by a tropical garden and ponds. Tropical Garden. There is a large tropical garden at Prince Kuhio Condos with many varieties of palm trees and rare, exotic plants. Park. 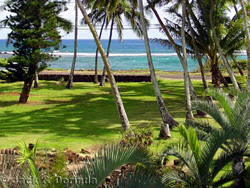 The large historical Kauai, Hawaii, Prince Kuhio Park borders one side of the vacation rental resort. Large Bedroom. With wall-to-wall windows, the bedroom is large, bright, airy and has a king size bed and sliding glass doors to the patio. The patio has a view of the ocean, park, and mountains. Many Extras There is an great stereo with CD player as well as Color TV, Cable, VCR, and Wireless High Speed Internet. There is a BBQ grill and picnic area in the garden. The kitchen is fully equipped with gourmet cookware and many appliances. The condo is comfortable and very nicely decorated. There is a laundry room on site. Local phone service is free. House cleaning is available. Location. Dorinda and I have been vacationing in Kauai, Hawaii since 1984 and it didn't take us long to decide that we like this area and Kauai's Prince Kuhio Condos the best. We eventually bought our condo in February, 2000 and we stay there ourselves as often as we can!